Every February and March I forage my freezer. It’s my way of making sure that the food I buy and store in the freezer doesn’t get wasted. 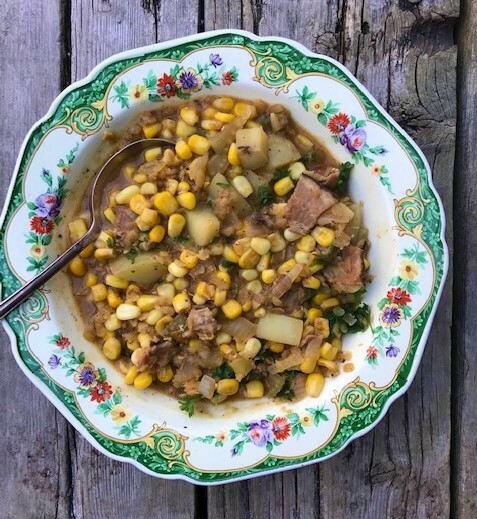 I found some frozen corn and regular bacon, not peameal bacon, lurking in the back, so I’ve put a spin on my own recipe for Grilled Corn Chowder that I usually make in August or September. To get that grilled taste, I toasted the frozen corn in a large dry saucepan until it started to turn golden brown. Depending on how icy your frozen corn is, this can take between 5-10 minutes over medium high heat. When it starts to get darker than golden, remove from the pan and set it aside. If you don’t have back bacon or peameal bacon, then you can sub in regular bacon. But it’s going to be fattier and change the fat content in the nutrient breakdown. I chopped the bacon I had into small pieces and then fried it in the same pan as the corn had been in, until it was well cooked. I drained the fat and then started the recipe as is below. Make this now or wait until corn season, your call. Heat a Dutch oven or a large saucepan or over medium heat. Add oil and bacon and sauté for 1 minute. Add onion and sauté for 3-5 minutes or until the onions start to become soft. Add potato, celery and smoked paprika and sauté for 1 minute. Add broth, lentils, salt and pepper. Stir in well, scraping any browned bits from the bottom of the pot to prevent burning and to add more fabulous flavour. Bring to the boil, cover, reduce heat to simmer and cook for 20 minutes or until the lentils are extremely soft. Add corn, return to the boil, cover, reduce heat to simmer and cook until the corn is heated through, about 3-5 minutes. Remove from heat, stir in parsley and serve. I ordered your new cookbook and it is arriving in May. Can hardly wait. I am a fan. I have Healthy Starts Here and Homegrown. Will definitely try this Grilled Corn Chowder. Bless your heart. I loved writing Peace, Love and Fibre and I think its my best book yet! This looks delicious and I can’t wait to shop my ginormous freezer to pull out some goodies just waiting for this recipe!! It’s kind of like a treasure hunt! You made my day! Thanks for sharing.